Most mornings this hike is inspirational and meditative. Some mornings, this hike blows my mind with its beauty. Today’s was one of the mind blowing mornings. This entry was posted in inspiration and tagged griffith park, Los Angeles on November 17, 2013 by Heather Arndt. Happy Los Angeles, and Heather Arndt are happy to host Lisa Sonora for her only LA workshop this year. An artful traveler is someone who longs to go boldly in the direction of their dreams. There is an allure and romance to travel…a call toward unknown lands and sacred places. Maybe we are, in fact taking a trip to a foreign land, and want to document our journey. Life is a journey. We have stories to tell, adventures to share. There are no ordinary moments, all is glittering around us, if we just knew how to look, how to find. We see beauty everywhere, we long to express what we see and hear and feel and wonder about….if we just knew how to capture image and word and feeling, drawing it out of the cloud forests of our imaginations. We long to express what we see and hear and feel and wonder about…if only we had an easy simple way to give it form on the page…in ways that feel good and life-giving and make us happy. To express the journey we are taking, we just need a few simple tools and different ways of working with them. The Artful Traveler is inspired by creativity and art-making, and also has fear that gets in the way…. but we find ourselves holding back, hesitating, dreaming more than doing. The compass pointing us on the journey we want to take is our heart. But the heart’s longings seem so irrational and irresponsible to the mind. The world we live in is a world made by rational decisions. We do what we’re supposed to do, what other people want, what other people expect, and find ourselves feeling uninspired, overwhelmed, worn-out, exhausted, maybe even angry. We might find ourselves doing a bunch of stuff we don’t want to do, and yet, still have long to-do lists full of things we just can’t seem to ever cross off. We imagine our problem is time. Or time management. How do we listen to the longings of the heart, when we’re supposed to be responsible and productive? How do we move forward when we’re so afraid: of how we’ll fail or succeed. Of what other people will think. Of how we might do it wrong or mess things up. Why an Artful Traveler Journal? Why a visual memoir? There isn’t a map or a guidebook that exists for traveling in this manner…so we have to use our powers of imagination and creativity to make the guidebook as we go. I believe that the heart’s longings are not random. What you long for in your heart will take you into the life you most want to live. I believe that everyone has creative powers. If you have dreams, you are creating. I believe it’s easy to learn how to tap into our creative powers to design the life we want to live. I believe that all desire to “make art” and “take amazing journeys” come from the wise place deep within our own hearts that knows the exact route to the happiness we seek. I believe that fear is desire in disguise, and that we can easily transmute fear into rocket fuel for the journeys we want to take. I believe we can learn how to be courageous and turn what we fear into an ally, while we are making more art and taking more journeys! We can get started right now. Our dreams don’t have to wait. What is a Visual Memoir? expressive writing + photography + collage + mixed-media art journaling. The Artful Traveler Journal is a beautiful, compact form that can be taught in a short workshop. It provides the container for our explorations. We will deal with that reason in the workshop. These are manifestations of stuckness, and there are many pleasant and wondrous ways out. I will gently guide you out of any stucky muck and back to your own happy creative place. la di da di da…. we’ve got books and magazines full of pictures of how other people do crafty art journals that inspire us but also tweak the overwhelm and envy buttons: How’d she do that? I wish I could do that! I could never do that! How do you travel so freely in the world? How do you have time and money and freedom to create? Where do you get the ideas for your work? How do you write so much? How do you keep your visual journals and sketchbooks while traveling? What supplies do you bring with you? Do you do regular writing separate from the visual journaling? How do you use photography? How do you make time for journaling while traveling? How do you work with limited supplies? oh…so many good questions. How do you create when you feel broken? How do you work when you don’t feel like it? How do you trust your heart when you’ve made a ton of mistakes? How do you create when you can’t draw or paint or write as good as everyone else? How do you move forward when it seems like so many other people are doing or have already done what you want to do? In this workshop, we’ll dive deeply into these topics while I’ll show you my favorite way to make artful travel journals. Once you learn these methods, you’ll be able to create artful travel journals on the fly, where ever you are, with whatever supplies are at hand. Most importantly, these methods will help you make maps and guidebooks of your own journey…toward more heart, more creativity, more freedom. Build a series of small, portable visual journals made up from unlikely materials. Create our journals out of unusual suspects, stuff that you can find at the office supply or grocery store. Make fantastic use of the stuff in your recycling bin and junk drawers…and long-lost projects. Once we build our portable journals, we’ll use one to document the days experimentations in visual memoir travel adventure. We’ll go on a mini photo and ephemera-collecting safari in the neighborhood and and learn how to incorporate what we find into our stories. We’ll make use of personal photos and objects we’ve brought with us, that we want to learn how to write about. We’ll play with collage and paint and drawing materials in ways that open up your unique expression and forever cure any doubts about how talented and creative and artistic you are. What could happen if you found a way to deal with doubts about your creative abilities? What new worlds would open up? Do you long to experience more beauty, more adventure, more color, more courage, more meaning, more discovery, more freedom…in your art and in your life? Author of The Creative Entrepreneur: A DIY Visual Guidebook for Making Business Ideas Real, (link takes you to Amazon) an award-winning book that has helped thousands apply create practice to solve both business and personal problems unique to artists (or anyone who doesn’t think like an accountant*). Visual Artist. In 2010-2012, I painted 1008 Paintings as a personal marathon. You’ll see more on that project here soon. Global Traveler. I’m inspired by wanderlust and passion to live life as a daring adventure. I take people on deeply creative journeys — both here and abroad. Digital nomad. Meaning that I live and work globally wherever I have Internet. Home base is currently Oaxaca City, Oaxaca, Mexico. Oaxaca is way far South in Mexico, close to the Guatemala border. If any of this sounds interesting to you, let’s connect. You can also get posts and advance notice of discounts/special offers by email. *Not that there’s anything wrong with thinking like an accountant. In fact, I wish I could borrow your brain once in awhile. This footnote is in honor of my real-life CPA, who is the most literary, funny, kind (yet tough when need be) and talented accountant in the whole universe. I mean, who gets a year-end tax letter that makes them laugh out loud? I do. Thanks to Rick. This entry was posted in art in los angeles, Heather Arndt, inspired, on the road and tagged art workshops, Lisa Sonora Beam, Los Angeles, los angeles art, workshops on July 6, 2012 by Heather Arndt. One of the many reasons I love Los Angeles: every now and then a friend will invite me to a taping of a show. 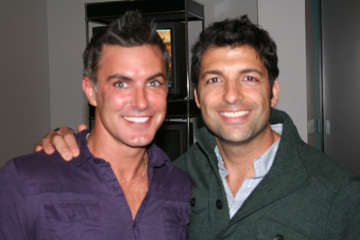 This time, high school chum, Aladdin Nabulsi invited myself and my handsome man to a taping of Fashion Police. 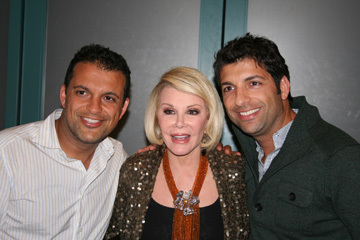 In preparation I watched the Joan Rivers Documentary … really an amazing story. We started the night out at Luna Park on La Cienaga, where I had steak salad and a glass of Sauv Blanc. Deelish. The show was a hoot! Tony Tripoli and Melissa Rivers are great interacting with the audience. Kelly Osborne and Joan Rivers are hilarious. It was lots of fun, not something I do often but a benefit of proximity to hollywood. Giuliana Rancic, and George Kotsiopoulos were funny as well! This entry was posted in Uncategorized and tagged Fashion Police, Giuliana Rancic, Joan Rivers, Kelly Osbourne, Los Angeles, Melissa Rivers, Reality television, Tony Tripoli on May 10, 2011 by Heather Arndt.